I used to live and work in Yosemite National Park, very close to Happy Isles, which is the northern terminus of the John Muir Trail. I long wanted to do the JMT, but couldn’t (or wouldn’t) get the time off. Eventually I left Yosemite for Arizona to pursue my career (and to enjoy a warmer clime!). When I moved back to California in 2014 for a job with generous vacation time, I knew the time had come. I spent days sending in faxes soliciting a solo permit and received a permit to start the JMT at Lyell Canyon. This was perfect, since I had hiked from Happy Isles up to Half Dome many times and did NOT need to do it again. I spent months planning my trip. Planning it became my hobby! And it was all I hoped and dreamed it would be. Except for my tent – which turned out to be not as weather-proof as I would have liked. I had checked it before the trip, but it turned out to be delaminated and leaked (but surprisingly not terribly) when it rained. You can see a list of what worked and what didn’t in my Day 20 entry – I spent a good bit of time at camp on my last night reflecting on my trip. See all my photos over at Flickr. Since I live at 500 feet above sea level, it was important to me to get at least a little acclimated before I began my hike. So my boyfriend and I stayed the night at June Lake, about 8,000 feet. Oh Ridge is a perfect little campground overlooking the lake, which was just barely warm enough to swim in. My boyfriend dropped me off at Tenaya Lake/Sunrise Lakes Trailhead in the late afternoon after waiting out a heavy thunderstorm. I had scored the last permit for the trailhead! As I departed, my achilles tendonitis twinged and I worried that I was making a terrible mistake (I ended up feeling just fine, even though it’d been bothering me for the previous two months!). I saw lots of wildlife as I ascended, including a grouse with her two chicks. I intended to summit Cloud’s Rest the next day, so I camped a bit east from the Sunrise Lakes junction near a meadow. The clouds parted at sunset to cast a golden glow on the trees surrounding my camp. I stashed my bear can and tent near my campsite and set off to Cloud’s Rest. I planned to camp at Sunrise Lakes, so I would pass by my campsite again, and I hoped I wouldn’t lose the location! The trail to Cloud’s Rest was filled with the most vibrant wildflowers! I even saw a blonde squirrel for the first time. This was my first time summiting Cloud’s Rest so I wasn’t sure what to expect. The few hundred yards to the top of Cloud’s Rest felt very exposed. But I had the summit to myself, a 360 degree view! I could see Yosemite Valley on one side to the peaks of northern Yosemite on the other to the Minarets near Devil’s Postpile on the other. My solitude was especially pleasing since I could see a queue forming below on Half Dome’s cables. As I returned the way I came, I easily spotted where I left my things, and the sky began to cloud over as I picked my way back up the trail to the Sunrise Lakes trail junction. When I hit the first of the lakes, the clouds had lowered and thunder began. I camped near the shore of an eastern lake, and napped through afternoon drizzles. Night time brought bright flashes of lightning on the horizon above where Tenaya Lake would be. Thunder boomed and echoed through my granite basin. Most strangely, I could hear occasional motor sounds from the Tioga Road down below, even though it seemed too far away. My gear was damp after a night of rain. Morning fog gave way to bright sunshine. I met up with the JMT officially after passing through Sunrise High Sierra camp, where the trail gets really confusing. I crossed my first pass, Cathedral Pass, which wasn’t much of a pass at all. I stopped at a sunny exposed campsite with a view of Echo Peak to dry out my gear and have a snack break. I met a guy that was on the last day of his northbound JMT hike – he had only 20 or so miles to go to Happy Isles. I was fortunate to get everything dried out, because the sky clouded over again, and a mile or so after I passed Lower Cathedral Lake a hail storm began and I hunkered under a tree until the pellets shrunk to a less brutal size. I was excited to hit Tioga Road and wait with a few other hikers for the free bus to the post office where I got some snacks and then found a spot to camp at the Tuolumne Backpackers Campground. The rain never let up that afternoon! I wandered around Tuolumne, first to get my official JMT backpackers permit that I had reserved at the ranger station, then I called my boyfriend from the payphone at the post office, then I remembered I had forgotten my resupply that I left myself at the ranger station and headed back again. At sunset, the clouds magically parted again to light up golden streams of cloud vapor streaking past Lembert Dome. The day began in brilliant sun, and I was excited to enter Lyell Canyon, which I had heard many wonderful things about. I hadn’t slept well so far, so I was feeling pretty exhausted. I had the most wonderful breakfast sandwich of my life at the Tuolumne Grill and got a late start hiking, about 10 am. Lyell Canyon was beautiful, but went on forever. I had only about an hour of sun before the clouds returned and drizzle began. Of course the drizzle eventually turned into a downpour, and then hail, and I was incredibly grateful for my waterproof boots, rain jacket, and pack cover. Lyell Canyon basically went on forever in the dreary rain. I met two women that were planning to spend a full four weeks on the trail. I complained that I had yet to sleep well, and one of the women said she had heard it takes 5 or 6 days to feel “normal.” Many switchbacks later, I was so happy to finally end up at Lyell Forks, where I intended to camp. Alas, at the Forks bridge, hikers were setting their tents up practically on top of each other. Campsites were overused and pounded into dusty dry clearings. I kept walking and spotted a rocky outcropping about a quarter mile on, which ended up being one of my favorite campsites. Perched up on smooth granite, I had a lovely view down Lyell Canyon and the nearest neighbor was far far away. I was surprised, not for the last time, to see evidence of human construction so far away from civilization. Lazy wires hung abandoned from two trees above my site – the remains, I assume, of the wires/poles that hikers used to hang their food from to keep safe from bears. This would be the first day that it didn’t rain. Huzzah! The trail between Lyell Forks and Donahue Pass was stunning. I spotted what remained of Lyell Glacier. It’s now classified as a permanent snowfield. Not enough heft left of its former grand self to even be considered a glacier. The trail was uncrowded and beautiful until Rush Creek, where there were a LOT of people. Island Pass, like Cathedral Pass, was practically a nonevent and it was a pleasant downhill to Thousand Island Lake, someplace I always wanted to visit! I found a wonderful secluded campsite with a view, and swam in the lake. Finally, a decent night’s sleep! For me, it did take 5 nights to finally sleep well. Normalcy, at last. I originally meant to take a side trip to Ediza Lake, and cross through the rest of the lake basin to meet up again with the JMT, but I was pooped and didn’t feel up to it. I was also looking forward to the next day’s resupply and just wanted to get down. I thought that I might camp at Trinity Lakes, but they were stagnant, and no campsites looked appealing. A lack of water after the lakes kept me hiking all the way to Minaret Creek on the edge of Devil’s Postpile, where I filled up my bottles and had a good night’s sleep. The weird thing about camping there was that the soil wasn’t soil – it was pumice! Tiny little grains of dusty gray pumice. Crossing into Devil’s Postpile felt really awesome. Using only my own two feet, and my awesome trekking poles, I had come more than 60 miles from Yosemite through national forest to Devil’s Postpile National Monument. I stopped by the Devil’s Postpile monument itself, quiet yet in the early morning, and hopped onto the bus to Red’s Meadow. Riding the bus was also pretty awesome. So fast and no effort on my part! I spent way too long at Red’s. I got my resupply quickly and charged my DeLorme and got lunch at the Mulehouse Cafe. The DeLorme took forever to charge! I also discovered that I was really sunburned. My plan to just wear long sleeves and a hat wasn’t working. My hands were red, as was my face, probably from the reflected sunlight off the granite everywhere. Fortunately, I found a small bottle of sunscreen in the hiker barrel. When the DeLorme was finally mostly done charging, about FOUR hours in total, I departed for Deer Creek. It was steep and hot and exposed out of Red’s, but only a few miles to my destination. Deer Creek was said to be the only water for several miles, so there were a LOT of campers there. I should have tried harder to find a more secluded campsite in the sparse and open forest but I was lazy and also feeling kind of lonely so I wanted to be around people. Even though I just wanted to sit and read my book. Day 8 – Purple Lake & Kate! I didn’t do very many miles today, but I was really exhausted. I was miserable most of the walk from feeling tired and from my own personal squad of flies that decided to accompany me. I would meet my sister today at Purple Lake! She was hiking in from Mammoth, and decided to do the whole distance in one go, about 17 miles. My sister is crazy. I worried that she wouldn’t find me – I was able to text her using my DeLorme before she left Mammoth, and I left her a note under a rock at the Purple Lake junction. Of course, my sister is a super hiker, and she found me and my camp as it was getting dark. I was so excited to have some company, and she brought treats: apples! Fresh food was wonderful. Today was a near-o! Only two miles to Lake Virginia. I swam in the lake, napped, and did a lot of reading. The area was very exposed with only stunted trees. It was a lovely day with great weather and alpenglow at sunset. My sister was so mad. I got up before the sun hit our tents, and spotted something running across the open field. A Great Sierra Hare! The giant rabbit stopped to chew something, ears flopping over, then ran on and disappeared into the scrub. Okay it wasn’t really a Great Sierra Hare, the giant rabbit of backcountry myth, but I think it was a Snowshoe Hare, a very rare sight, and a big animal for a rabbit. I told my sister about it and she was ticked – she spends a lot of time in the backcountry and had never seen one. Today was a really long day. I had the idea to do some extra miles so we could get our resupply at Muir Trail Ranch and then have some shorter days before Kate had to go back to work (she was only joining me for the middle week of the three I would spend on the trail). We went down into Tully Hole, then up and over Silver Pass. The lakes at the pass were lovely. Coming down from the pass was fairly brutal. Lots of elevation loss, and I was really tired again. We finally hit Quail Meadows a couple of hours before sunset. Again, the whole day was filled with flies, very annoying. Quail Meadows wasn’t really meadows at all, but a big dusty horse camp that marked the turnoff to Vermilion Valley Resort, where you could resupply if you didn’t mind going a few miles out of your way. Another tired day. I felt like I was dragging myself the whole day. I drove Kate crazy with my tiredness. But Marie Lake was worth it! Kate found a perfect little campsite above the lake, and the cutest little rain cloud came over around sunset. Its adorable little drizzles created the most perfect double rainbow, and we took about a million pictures. Also, today was a milestone – I had hiked over a hundred miles! The farthest I’ve ever walked in my life. Selden Pass was another easy pass. We lingered at Sallie Keyes for several hours. Kate read while I swam in the water, and we both sunbathed until rain clouds rolled in. Fortunately it didn’t rain heavily as we picked down the switchbacks toward MTR. We planned to camp outside of MTR tonight and pick up our resupply tomorrow first thing, getting a full day ahead on our itinerary and allowing extra time in Evolution Valley. We camped in the communal camp area next to the San Joaquin and carefully crossed the river to find the hot springs, which were wonderful even though they smelled like sulfur. I wouldn’t camp near MTR again – the morning revealed how crowded it had become in the night. Later in the day, I saw lots of better places to camp next to the river a little further down the trail. We went to MTR, picked up our resupply, and charged our electronics as we shoved food into our bear cans and rummaged through the most amazing hiker barrels for snacks. Not coincidentally, when we finally departed MTR, I was practically bouncing down the trail, full of energy. Apparently I just wasn’t eating enough on this trip, and the extra calories made a huge difference in the way that I felt. And I felt wonderful. We crossed into Kings Canyon National Park – another milestone!! The scenery was gorgeous as we followed the San Joaquin up-canyon. A thunderstorm rolled in when we crossed the river and started up switchbacks to Evolution Valley. Only drizzle, though, and Kate found us an amazing campsite in a stand of pines next to Evolution Creek. We saw a doe and her fawn grazing in the distance. Lots of deer. Multi hour hailstorm at 12,000 feet! Evolution Valley was gorgeous, but the switchbacks up to Evolution Basin were grueling, and could really hardly be called switchbacks at all since they were so steep. We set up camp at Sapphire Lake. We had it all to ourselves! But once again, storm clouds rolled in, and we experienced the scariest, most intense, rain and hail storm ever. It was three solid hours of pounding rain and hail, booming thunder, and lightning. My tent leaked and the floor puddled. The storm was so loud I couldn’t barely hear my sister shouting back at me from her tent when we checked on each other. My tent was in a pond, but hers ended up in a creek. The water poured off the granite cliffs above our camp. It was amazing. But I was afraid my gear was going to get soaked and we would get hypothermia at least a 20 mile walk from civilization. As quickly as the storm rolled in, it was suddenly over, and we moved our tents onto higher ground. We dried out okay and I managed to sleep well even though we were at 11,000 feet. We didn’t get hit as hard in the storm as some others we met up the trail. We gained a thousand feet in the couple of miles after Sapphire, and saw other hikers with all of their gear spread out in the sun, drying out. This area had been hailed on as well, but the hail didn’t melt on the ground – there were large patches. This was Kate and I’s last full day together. I still had another week on the trail! It was another long day. I must not have eaten enough because I was exhausted, even though the trail was basically all downhill after Muir Pass. We took silly pictures with the Rock Monster in Le Conte canyon, and camped down near the ranger station. Today was a really really really long day. My sister left by exiting the Sierras over Bishop Pass, and I was on my own again. I was really sad to see her go. The trail up to Palisade Lakes was really tough. I didn’t realize that I had experienced the famous “Golden Staircase” until I had reached the top and took a break, and then I realized that explained a lot. So many switchbacks! I had intended to camp at the Palisade Lakes, but there wasn’t much camping or much water, and it was very exposed all around. I ended up tramping up Mather Pass, which was pretty endless and horrible in the afternoon sun. I camped in the wide open Upper Basin a couple of miles after the pass and I really liked my campsite. For the first time, I was incredibly alone in the middle of nowhere, and I was totally comfortable with it. The stars were brilliant in the moonless night. I had a rough morning. My camp was around 12,000 feet, and when I pulled out my quilt to dry in the morning before the sun hit my tent, my quilt froze instead of drying. My pack had frozen dew on it, it was so cold. Naturally I lost my balance when I went to get water and ended up with both socked feet in the freezing creek nearby. Once the sun was up and I swapped out my dripping socks for the previous day’s merely damp socks, I enjoyed the walk down-canyon. The Bench Lake area and Pinchot Pass were both gorgeous. But the trail down Woods Creek Canyon seemed to never end. I enjoyed bouncing my way across the suspension bridge at Woods Creek Crossing, and eventually decided to camp down the way at the far corner of the camping area – it was very crowded, and again I was surprised that so many people were OK with camping right on top of each other. I am torn between delight and devastation at the thought of this trip coming to a close. I’m ready for it to be done, but I want it to never end! Not quite a near-o today, but I only walked 7 miles to Upper Rae Lake. I was so tired! My hips and knees ached. And I have 45 more miles to go, in only three days. Forester Pass is tomorrow and I am dreading it. Trail was crowded, the Rae Lakes are beautiful, but the camping is also limited and crowded. I hiked 16.1 miles from Upper Rae Lake to south of Forester. I was really proud of myself – I got up before dawn and for the first time broke camp at 7 am! Glen Pass was amazing, no bighorn though. The trail was mostly unexciting until dark clouds moved in as I approached Forester Pass. They made me nervous, but there was no thunder or lightning, and even though it snowed I pushed on. 13,000 feet! It was a bear and I was stoked to summit the pass and enter Sequoia National Park. Weird to be the next-to-last night. Trying to eat all my food before I exit the trail – I need the calories! I wouldn’t camp at Guitar Lake again! There is no privacy or shade here. Crabtree Meadows looked way nicer. I’m nervous and anxious that this is my last night on the trail. But I’m ready to be done with this trip and I’m ready to go home. Bring rain pants! Frogg toggs. NO wasabi peas or dried apples. Yucky on the trail. I woke up at 2 am so that I could summit Whitney by dawn. So many people were camped at Guitar, and SO many of them were also up and moving up the trail at 2. There was no moon, but the sky was clear and the stars bright. The switchbacks up from Guitar took forever. Every time I paused to congratulate myself on my progress, I looked up to see headlamps blinking another thousand feet above me, it seemed like. So far to go. I left my bear can and tent at Trail Crest Junction. The sun started to glow on the horizon in the last 1.9 mile approach to the summit, and I panted as I hustled in the darkness to make the summit before dawn. The summit of Mt. Whitney was incredibly windy and incredibly cold. There were probably 30 people milling about waiting for dawn, many wrapped in their sleeping bags. When the sun finally broke the horizon, someone said “there it is!” and about three zombies responded, “yay.” We were now free to leave, mission accomplished. When I picked up my bag to head back down, I found that in the 30 minutes I spent on the summit, my water had frozen. I got back to Trail Crest quickly, but the trail after that was the longest of my entire life. I thought, “only 8 miles! It will be so quick and so easy!” But I forgot that it was also around 6,000 feet of elevation loss. I was impatient to get down to see my boyfriend and eat hot food that someone else would make for me, so I didn’t stop for a break. Bad idea. I pounded the crap out of my knees and my hips. The switchbacks were interminable, but at the parking lot, there was my boyfriend! He handed me a cold can of Dr. Pepper and I was basically the happiest girl in the entire world. And then I got a veggie burger, another soda, and a beer, and a shower at the Whitney Store. And then we got Del Taco on the way home. And it was glorious. The JMT was awesome. And I’m so glad I got to finally do it, thanks to my generous vacation allowance at work. 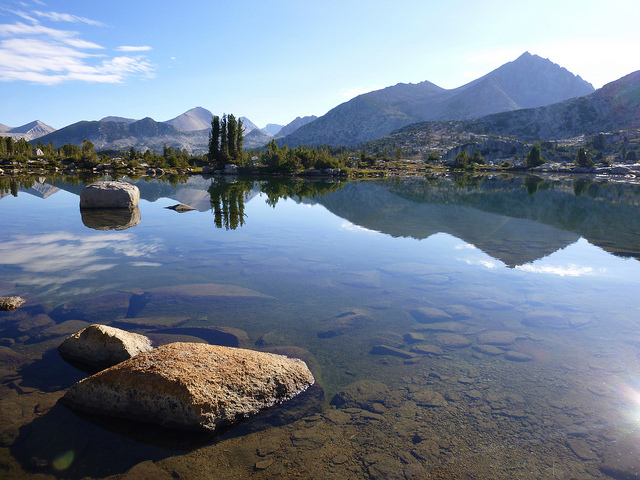 But hiking the JMT is like speed-dating with the High Sierra! There were so many places that I wanted to linger, but I couldn’t, so now I’ve got a list of where I’d like to return. I learned that Yosemite is not the awesomest part of the Sierra (sorry, Yosemite!). Sequoia/Kings Canyon backcountry is where it’s at, and where I will return. There are many valleys that look similar to Yosemite Valley, and many meadows that look similar to Tuolumne. I had no idea. I haven’t decided yet what’s in store for my summer in 2016. I could do the JMT northbound, but I wouldn’t do the whole thing, and I wouldn’t do Whitney again! Once was enough. I might do the Rae Lakes loop, though it seems very crowded, or I might do the SEKI loop. Decisions decisions! I feel great that I did the entire JMT. I didn’t get injured, I didn’t get hypothermia, and I did not quit – not that I wanted to! The worst thing about the JMT: I can’t stop thinking about it!